Update: it is September 2016 now and I am still using this phone cover from Hongdae. This would be my fourth time in Korea, and possibly the most fulfilling (or, filling?)! I used to feel really guilty about buying all sorts of things I didn’t need but were interesting and cheap. This time we managed to curb our impulsive spending and I only got some shades of eye liners and nail polish despite being faced by a Faceshop, Etude House and Innisfree every corner I turned. Also, this trip was particularly special because my papa came along. It was the second time I ever travelled with him in my 27 years. Of course, that entailed a whole different dimension of planning where I really had to find all the budget and good food. My family is generally not into chionging to all the places of interest. Well, my mom is because she likes to venture but it was probably her fifteenth time in seoul. I like it chill with a good mix of landscape, walking and LOADS of good food. Sister generally likes to wake up a little later because sleep is rare for her. And well, papa just doesn’t like to spend money. So admission fees or gst is usually faced with a frown. 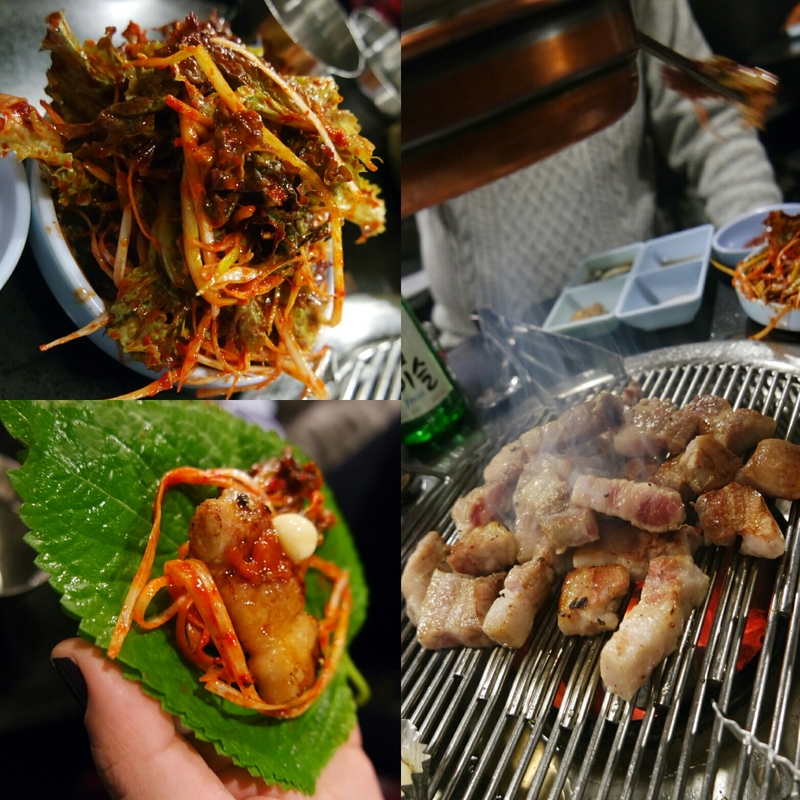 On our first night upon arriving at Ninetree Myeongdong, we found a Korean BBQ place nearby. The rice was good and the beef was fairly tender. But the bill came up to a typically Korean BBQ restaurant price and that was the end of our peace at night. We were banned from eating that for the rest of our trip. 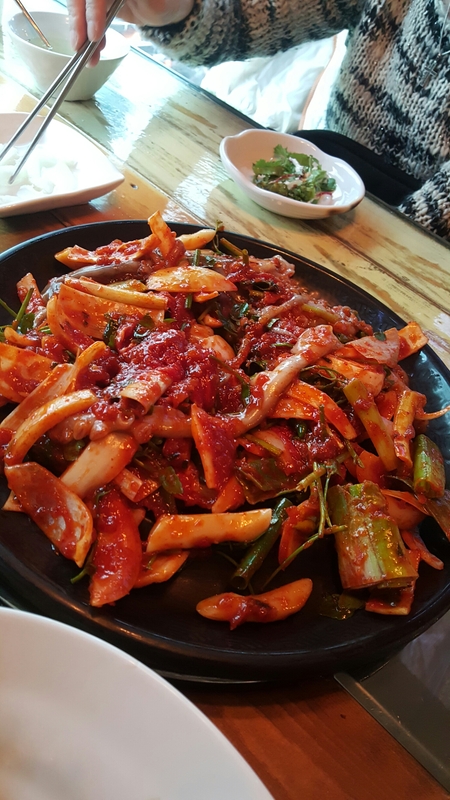 This time round, we had much more street snacks than before – not sure if it really changed that much from just a year before, or that we didn’t walk at the right parts of Myeongdong? Ahh, I remember now. I was sick last year in Seoul. Extremely unpleasant. Apart from these, we also had the food that we tried in 2014. The Ginseng Chicken Soup, that Grandma’s Dokbokki at the Tong-in market, Seollongtang, Beans Bin, and that Gimbap place near Mcdonalds. I wasn’t feeling the chicken soup that day – especially after papa refused to let me order the black chicken soup which was significantly more expensive… What a brat. Well I have since repented. The roasted chicken wasn’t good. On days, we tricked papa into resting in the hotel while we snuck off to have ice cream. Amongst many other simple and affordable dishes, there’s ramyun, kimchi jigae, jajangmyun, tonkatsu gimbap and pork bulgogi rice. Our favourites. The old kimchi jigae place opposite beans bin (not entrance to entrance but the window counter seats of Beans Bin faces this place which is on the second floor of the other building) was replaced by this. I have no idea what it is called, but it comes in permutations of chicken / squid / octopus. It was our favourite throughout the trip because it was really near our hotel and the young lady at the shop took care of us well – how else would we know how to prepare this dish? 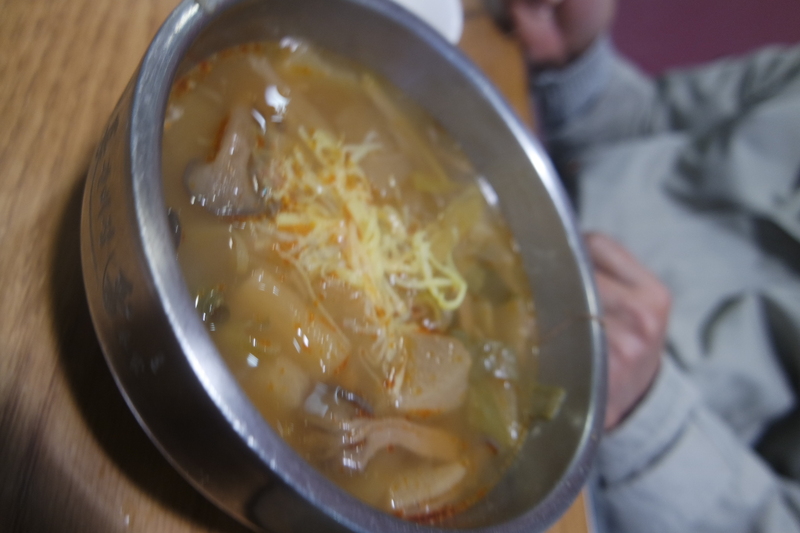 Apart from revisiting the usuals, we managed to make a trip to Noryangjin! It was great because papa is big on seafood and none of us were ill this time round. Almost went back a second time. Almost. 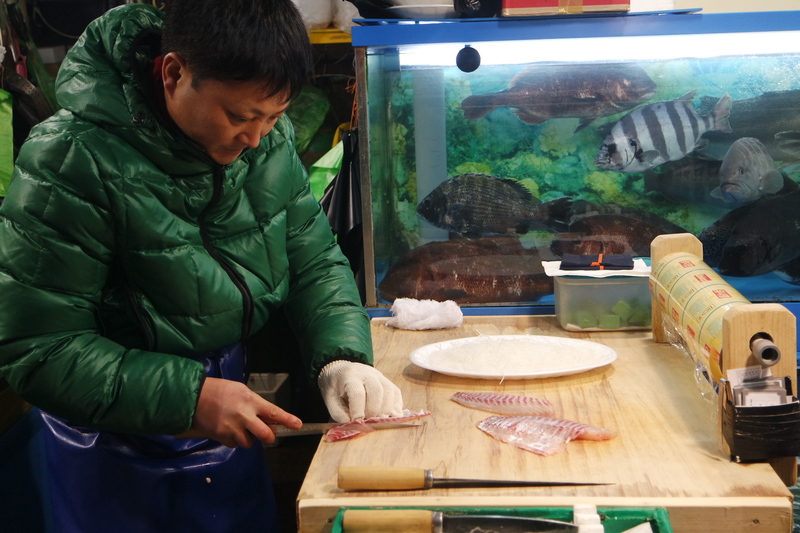 Got some delish selfish and other water creatures from this pretty auntie and went down to the shop to get it cooked. The only thing we didn’t really enjoy so much was the sashimi. After choosing all the shellfish and heading to the eatery to have everything cooked in the various ways, we saw another table having soup. Anything that’s in a pot over a flame looks good to me. So papa and I went up and found a fish from this guy. 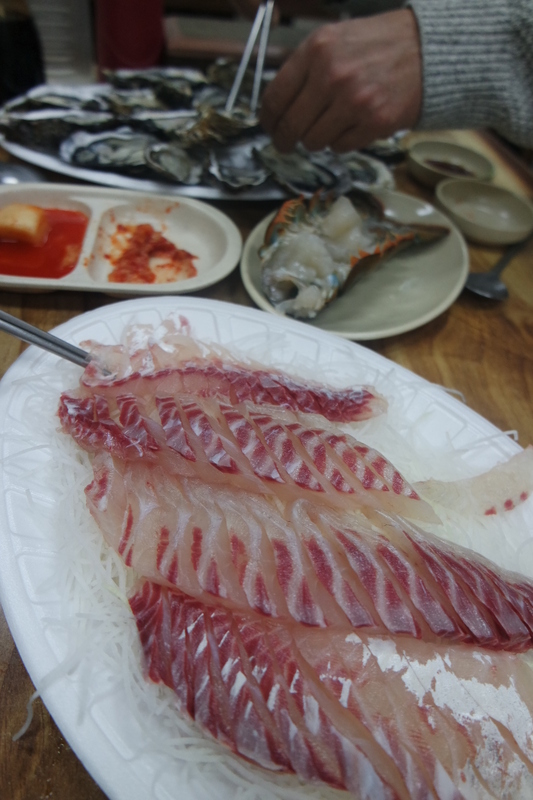 Not sure if the norm was 100,000 won for a fish, but that’s what we paid. The snow crab was 120,000. Steeper but far more worth it as you can see from the chunks of meat. The ahjummas who opened this eatery were from China and seemed to miss home a whole lot. It’s really easy for Singaporeans to find our way around because we probably know enough of mandarin and korean to converse. I admire these ladies who leave their homes to make a living somewhere else. It’s really something I haven’t got the courage nor circumstance to do. We also discovered where Jangshou really came from! Myeongdong! Maybe the Singapore Jangshou got its name inspiration from there. The concept was pretty different though. This jangshou sold portions of galbi, bulgogi, galbitang and yukgaejang. Only these 4 dishes. 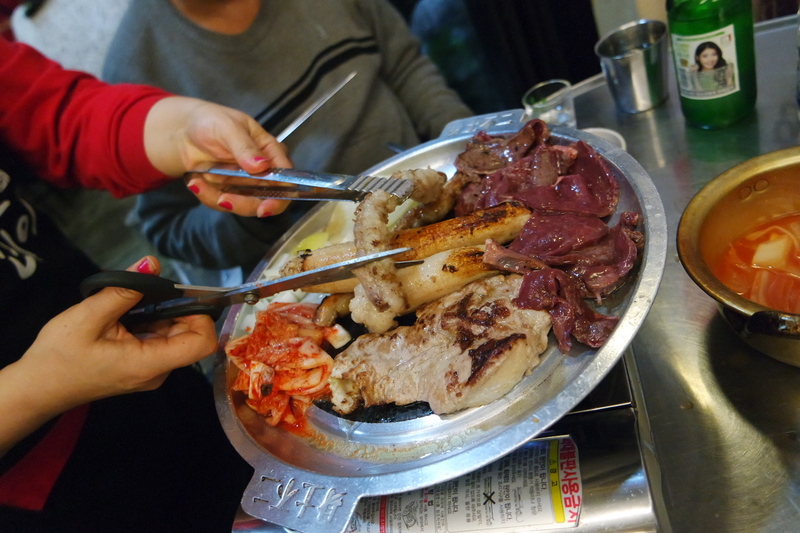 The meats were served on hot plates and were extremely affordable and decent in quality. And because we were on a budget, this was the perfect option for us to get our beef fix since we were banned from expensive BBQs. One good find, plenty more to go. I wanted our trip to be something different this time and was desperately sourcing for more authentic local food. Unfortunately, we were not too impressed by the dishes at the market. Not too sure if it was because it was that stall, or that the dish was like that. The uncles eating there seemed to be enjoying themselve though. I’ve always wanted to try these but they turned out pretty disappointing. The mungbean pancakes were good though. 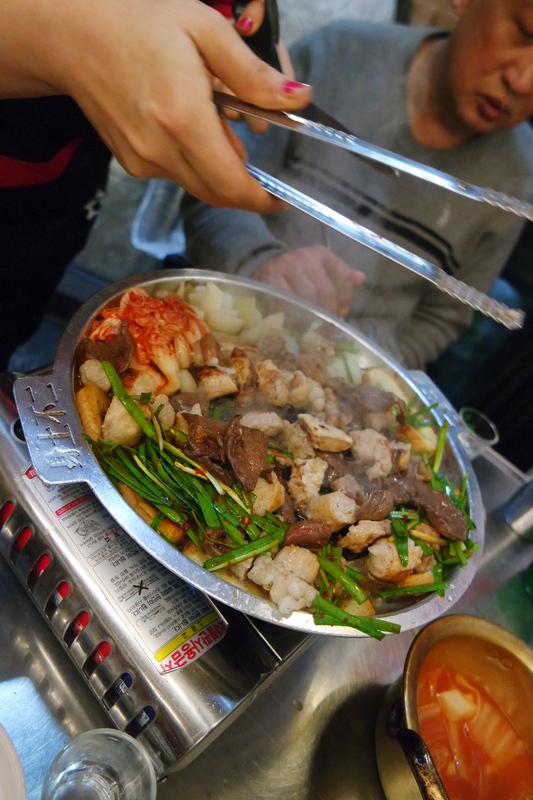 And while on the topic of authentic – I thought this was pretty authentic: cow intestines BBQ. I was actually trying to find some other intestine place at gangnam and we actually spent pretty long searching for it. Almost have up but my limited Korean helped find this other intestine place. Not too impressive an effort since it seemed that the stretch was full of eateries selling intestines! It was just a matter of deciding on which to eat at. It was a good choice as one of the ahjummas was from China and so we conversed in Mandarin. She recommended what the locals usually had and gave me some insight on which was actually the better intestine in the cow. The smaller one. Which has a similar consistency as the large pig’s intestine. She seemed to really miss home and was happily chatting away with us in spite of our not-so-good mandarin. The place was somewhere in Gangnam, near Kyochon. But I forgot to take a namecard / signboard. Did a quick search and found this even more appetising one. Not for the fainthearted. Might try it the next time we head back. Ordered a box of Kyochon chicken wings for supper. Unfortunately, it was disappointing. The trip back wasn’t that long. I even found four fingers to be more flavourful. 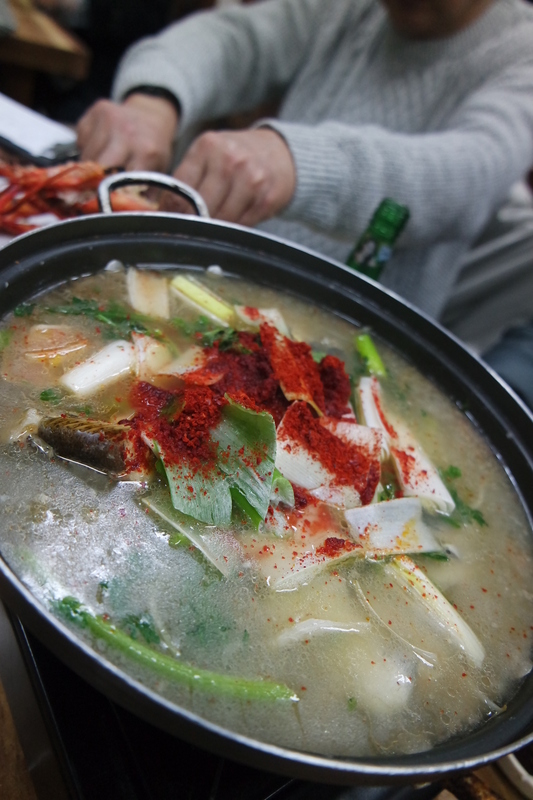 Another authentic dish was jokbal, which are pigs’ trotters. I saw this for the first time in a k-drama where the female protagonist craved it everyday when she was pregnant. It’s something that papa liked and he appreciated the ones that I found. We tried two different eateries’ and both had its unique taste. But this was the first that we tried. I preferred the one above as it was less oily. I never liked eating pig’s trotters because of all the fats which usually got a bit too jelat (Singaporean term for something that it’s too ____ that it gets sickening). You gotta trust the signboard that says 뚱 뚱 when it comes to food. Fat fat! The one below was a two storey eatery that seemed to offer more items on the menu. But if I could only choose one, I would choose this. Not a fan of mandoos, which explains why I preferred the one above instead. Another new find. This little BBQ place which had cheap beef and pork. We spent a long time looking for this place as I just kept missing the corner for this hidden place. 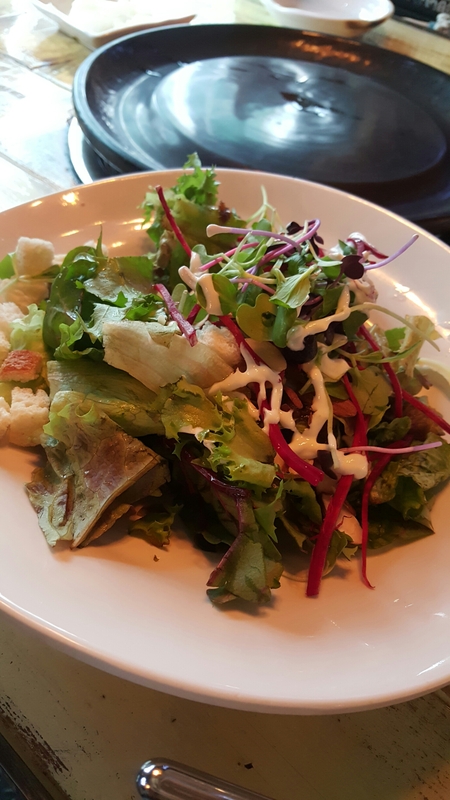 The restaurant is known for this spicy salad side that they serve. Totally pleasing to my tastebuds. The pork belly was the star here. We also tried pig’s skin – but I concluded that I don’t enjoy it in general. Not in kway chap, and not in Seoul. We saw the other tables having this little gold pot on their grill. We tried to order and can’t remember if it was complimentary. It ended the meal on a nice soothing note. 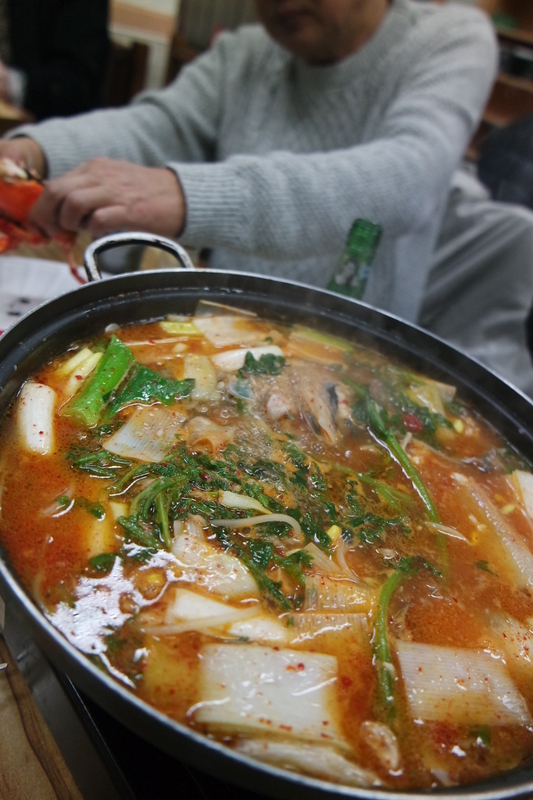 We brought the papa to Ewha University just to incorporate some walking in the itinerary. 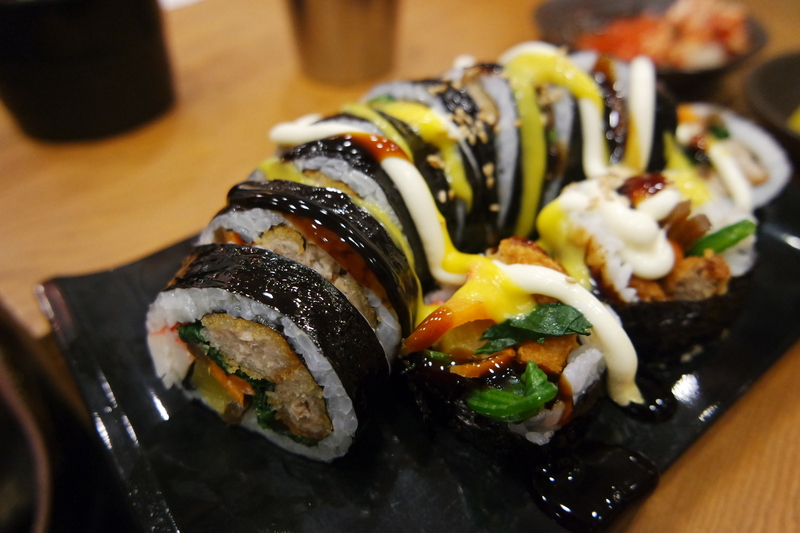 But really, when in Seoul, it’s just all about food for us. Nonetheless, we captured some pretty photos for the parents there. Also visited Gyeongbokgung for the first time. Well, we can’t keep eating and eating right. We did plan our day around what we wanted to eat nearby though. 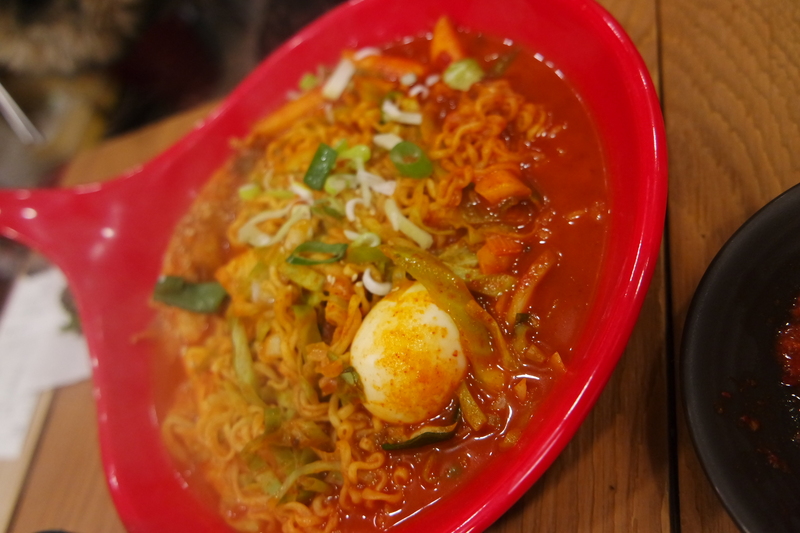 The gingseng chicken and tokbokki were priority. Also managed to navitage the trains and buses to go to Heyri Art Village. It was pretty inspirational to see artists follow their dreams, but nothing really left an impression there. Jiejie’s sweet finds. Brownie and custard pastry from Tous les jours. We stocked up every other day. Even I really liked it and craved it after our meals. Seoul’s always my go-to place if I want a familiar getaway. Funny how relaxing it is to escape from one bustling city to another. Well, there are just too many days where life here is just too hectic, and I have to force myself to leave in order to leave work out of my mind. Singapore’s my home, but Seoul’s probably my second home. No connections nor friends there, and neither the language to communicate effectively. But still a comfortable place to be in. Connected enough, advanced enough, and foreign enough.